The ProForm Smart Strider 695 CSE is one of three new ellipticals in the series introduced for 2017, with upgraded features from previous models making it very appealing. It's a nice step up from the 495 CSE base model. The 695 CSE is made of commercial gauge steel and features a rear drive foldable design, with a Round Watts display showing you exactly what Power Zone you are in for optimal training. The Smart Strider redesign has received positive reviews from most experts in the industry, as they have upgraded many different features from previous models. The CSE 695 elliptical sits right in the middle of the new model pack...it is a step up from the base 495 and a step down from the new CSE 895 model. These ellipticals are essentially entry level machines designed for basic use. They range in price from about $599 on sale to $999 for the high end model. So these are more for beginners or light users who are looking to get into shape and lose a few pounds. The CSE 695 does have a lot of nice features though. You get iFit Coach, a full immersive program that gives you unlimited personalized workouts, tracking and sharing capability, meal suggestions and Google map track integration. You also get a wearable activity tracking device, kind of like a fitbit, which is included for free with a yearly membership to iFit Coach (price varies). In addition to that you get very easy assembly...you can have the elliptical out of the box and set up by yourself within minutes. SpaceSaver design allows you to fold up the machine after your workout and store it away with the transport wheels. 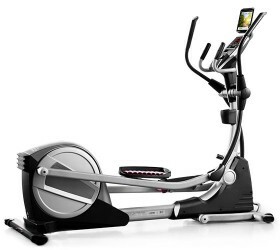 Other nice features include power adjustable incline up to 10 degrees, not found on the base 495 CSE model, soft grip workout arms, heart rate monitoring, oversized cushioned pedals, 20 resistance levels, 24 built in workout programs, SMR resistance, iPod compatibility and a cool air workout fan. So the 695 has a ton of good features...but anything we didn't like? Well, all of the Smart Striders have 18" strides, which are not ideal for taller users. If you are on the taller side and you like ProForm ellipticals, take a look at one of the higher end models. It's definitely a nice step up from the 495, but for our money we'd step up to the 895 for the touch screen with internet and wireless heart rate monitoring with free strap. That one also has more workouts, more resistance levels and a better warranty. Still, for just $799, you're getting a lot for your money with the Smart Strider 695 CSE. If you're looking for an inexpensive, entry level machine the Smart Strider 695 CSE is a very good choice. It has iFit technology, power incline, easy folding, lots of workouts and many extras such as a workout fan, leveling feet, cushioned pedals, iPod compatibility and more. Still, with an 18" stride it is not going to be comfortable for taller users. But if you are of average height it should be just fine. We would spend the extra $200 however and go with the up-level 895 CSE model which has a lot more to offer. The ProForm 695 CSE elliptical is on sale right now!